Originally conceived of by Ghillies in Western Ireland in the late 1800’s, the Ghille Kettle has since been improved and modernized, while staying true to the original purpose: boiling water quickly. Old AuSable Fly Shop has recently been announced as exclusive distributor of the product in the United States. For over 100 years, the English chimney kettle has been used to quickly boil water in nearly any weather using just the combustible materials lying about. No expensive canned fuel, no extra weight, no hauling out the empties. Once filled with water, put the whistle cap on the spout and build a small fire in the base. Add fuel as needed by dropping it down the chimney. The heat transfer from the large surface area of the chimney quickly heats the water. With a bit of practice you’ll have a nice rolling boil in about 4 to 5 minutes. Our kettles are the only ones made with our exclusive Safety Whistle Cap.This feature announces you’re at a boil; it keeps the water from boiling out thespout and dousing your fire plus it eliminates the danger of the kettle rupturing like the others on the market that have a cork. All Ghillie Kettles are hand crafted in the UK and they’re available in 3 sizes, the .5 liter Maverick, the 1 liter Explorer and the 1.5 liter Adventurer. All include a carry bag for storage and an instruction sheet. Optional “cook kits” (pot, lid/fry pan, grills, pot gripper, base stand and pot support) are available to harness the heat from the chimney and/or the fire base to cook small meals in addition to boiling water. The Ghillie Kettle is elegantly simple, incredibly efficient and is hand crafted to the highest quality. These kettles have been around for over 100 years but are not known well here, but we’re changing that. 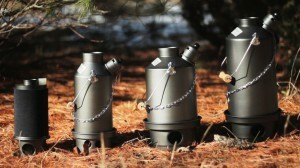 Ours are the only chimney kettles made with the whistle cap and all are available in 2 anodized finishes (Flash Anodized or Type 3 Hard Anodized to British ISO 10074:2010 Standard) if desired. All carry warranties or 2 to 10 years.